I had a chance this week to speak to a room full of students at College Of DuPage. It was a panel discussion on “Making It In The Arts”. I want to thank Terry Vitacco from COD, and Amy Rodgers from North Central College for putting the whole thing together. We covered a wide range of topics, and I hope some of the information that was shared was helpful. I know we talked about the benefits of networking, assisting, and finding out where your passion is. And I’m sorry if I shocked anyone when I said that I didn’t use contracts (I really hate paperwork.) But I do have a system in place, and somehow it works for me. You’ll figure out what works for you too. * Social Media Used- I use Facebook, twitter, and this blog. Again, it’s what works for me. I keep hoping Pinterest goes away before I have to learn about it. Go away Pinterest! * How Do I Keep My Business Moving Forward- You have to learn how to market yourself even when you’re busy. Otherwise you get in a viscous cycle of super-busy and horribly-slow periods. Don’t take your existing clients for granted, and always network and reach out to new people. And after some continued experimentation, I happily got one of the more bizarre and extreme jumping images I’ve ever taken. 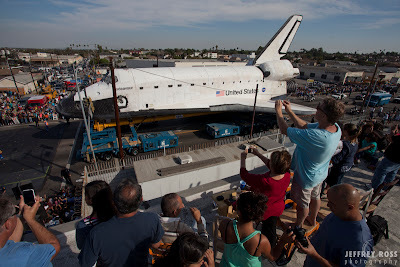 I flew out to Los Angeles to document the Space Shuttle Endeavour as it moved through the city streets to it’s new home at the California Science Center. It was a crazy schedule! Lots of late nights and endless hours waiting for things to happen. I spent most of the time paired up with photographer Rhonda Barczak, and we did our best to scout out good locations and talk our way in to interesting spots where we probably weren’t supposed to be. But we weren’t always successful. 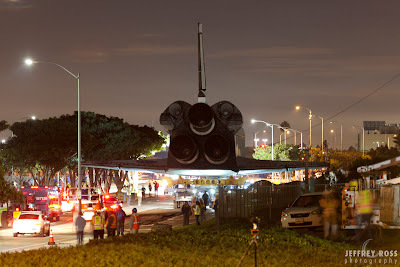 On Friday we found a great location on a bridge over the 405 that had a perfect view of where the Shuttle was going to go over the expressway. 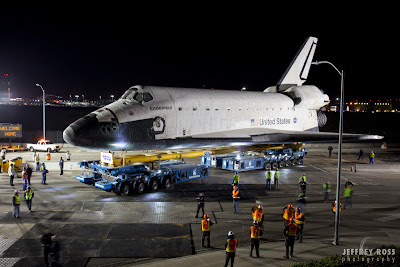 I had envisioned that the nighttime blur of the car headlights going under the shuttle as it made it’s way across the bridge was going to be one of my best images of the trip. Unfortunately, right before the shuttle made it’s move, they shut down all traffic on the 405. 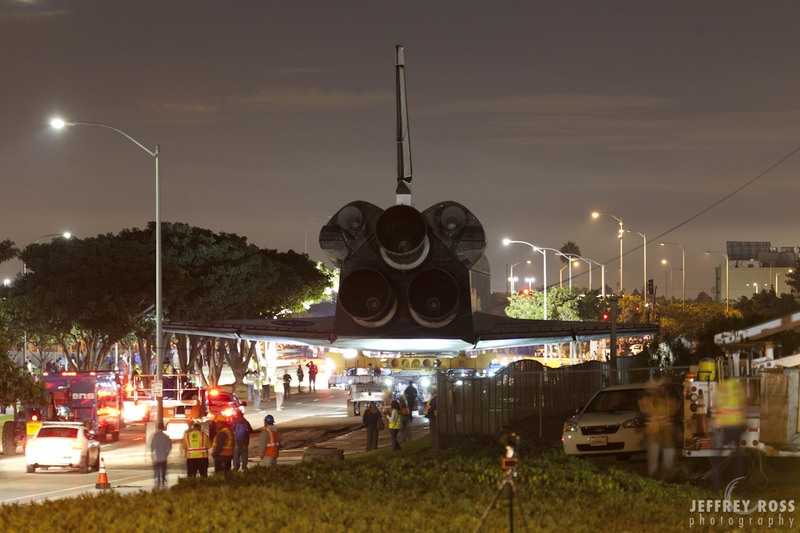 Instead of these beautiful streams of color, the shuttle was now moving over dark nothingness. I sat on that cold, windy bridge breathing car exhaust for 7 hours and had nothing to show for it. 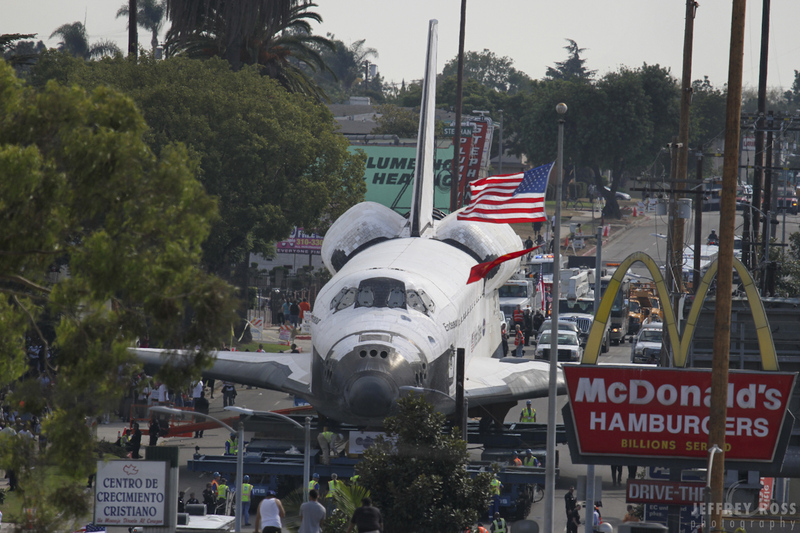 But Endeavour was starting to get behind on its schedule. 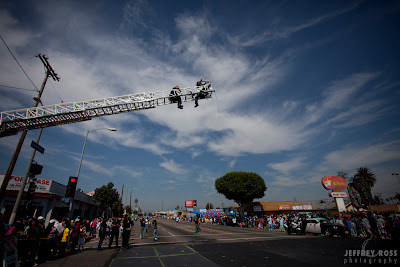 We left this location and quickly hurried up the road to the Baldwin Hills Crenshaw Mall where a large ceremony was planned. 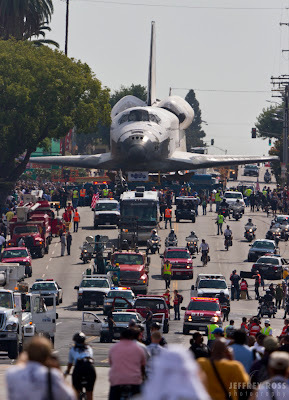 The shuttle was supposed to arrive at 2:30pm. Around 6:30 it started turning dark and the shuttle still wasn’t there yet. We were tired, hungry, and exhausted by that point and decided to take off. 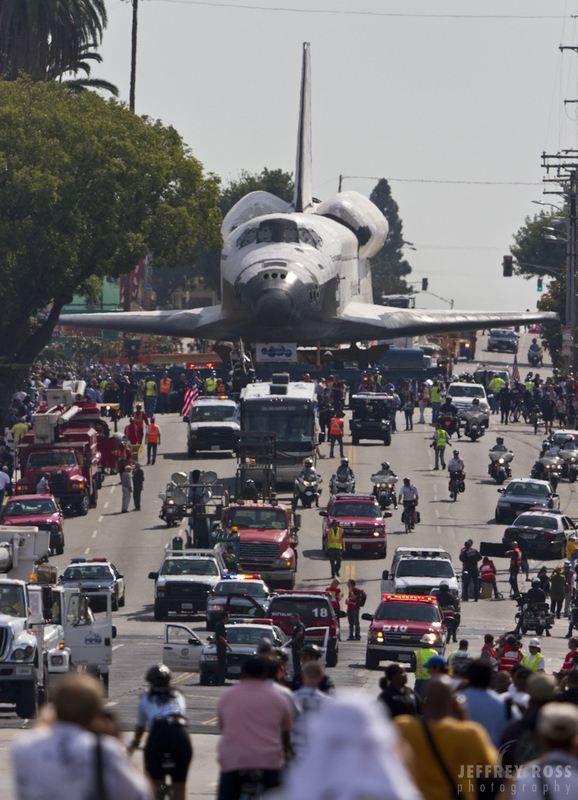 But what I was the most surprised about was to see how excited the city and the people were to have the shuttle pass through their neighborhood. It might have been crazy hours, but it was a heck of a great party. I’m a little sunburnt and worn out, but it was worth it to catch this once-in-a-lifetime event.